Considering that Jews comprised only 3.1% of the White population and 0.6% of the total population, South African Jews should take tremendous pride in the very high proportion that opposed apartheid one way or another. It is doubtful that any other separate group, whether Chinese, Portuguese, Greek, Catholic, or even the wealthy Indian Muslim community, can boast anything approaching the proportionate number of Jews who took part in the struggle against apartheid. Jews put the Progressive party headed by Helen Suzman into parliament and where there was no Progressive Party candidate, they voted for the opposition United Party. “That people of Jewish descent should be so prominent in the liberation movement says something fundamental about the compassion of Judaism. Many Jewish immigrants who arrived in our shores in abject poverty, laying claim to little but their rich commitment to humanitarian and egalitarian ideals. These commitments were sometimes rooted in traditional Jewish teaching. They sometimes emerged from traditions of socialism. Whatever the case, Jewish compassion is the fruit of empathy, rather than sympathy. It is the fruit of struggle over many millennia, against racism and persecution”. Considering that the small percentage of Jews in the total population included the aged, infirm and children, South African Jews, far from being shy about their history during the apartheid era, should take tremendous pride in the very high proportion that opposed apartheid in one way or another. Regrettably but unsurprisingly, the behavior of the Jewish community in South Africa during the apartheid period is regularly singled out for unjustified criticism, while no similar evaluations are made of the behavior of other demographic groups such as the Catholic population or the Portuguese, Greek, Chinese and Asian communities whose members hardly appear among anti-apartheid activists. Take the South African Muslim community for example, which comprised 1.1%[i] of the total population compared with the Jews 0.6%. The number of Muslims known to have actively opposed apartheid is minimal and in fact they were reported to have cooperated with the apartheid government. Jewish influence towards racial equality in South Africa dates back to the earliest days of Jewish immigration. As far back as 1917 a Yiddish-speaking branch of the International Socialist League was formed. This league, a forerunner of the South African Communist Party (SACP) organized unions and co-operatives without distinction of class or colour, eventually being absorbed into existing unions. Another typical example of the early days was the Garment Workers Union (GWU) a militant and multiracial trade union led by its general secretary, Solly Sachs from 1935 to 1948. White unions and the government fiercely opposed the GWU. Nelson Mandela in his “Long Walk to Freedom” wrote, “I have found Jews to be more broadminded than most whites on issues of race and politics, perhaps because they themselves have historically been victims of prejudice”. 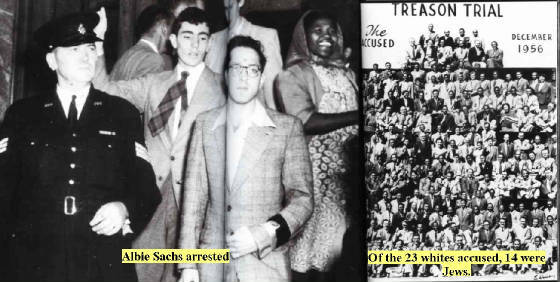 Of the 150 activists charged in the 1956 Treason Trial, 23 were whites. Significantly, of the 23 whites, no less than 14 were Jews. After the Sharpeville tragedy in March 1960, in which 69 Africans were killed and 180 injured the ANC and the PAC were banned. Oliver Tambo, Deputy President of the ANC, escaped, assisted by Ronald Segal, founder of the anti-Apartheid journal “Africa South”. The Communist Party and the ANC established underground headquarters at the Lilliesleaf farm home of Arthur Goldreich in the Johannesburg suburb of Rivonia. Nelson Mandela stayed there in the guise of a farm worker and it was there that a military arm, Umkhonto we Sizwe (The Spear of the Nation), was conceived. Its High Command comprised Nelson Mandela, Govan Mbeki, Walter Sisulu, Raymond Mhlaba, Joe Slovo and Arthur Goldreich, who was selected because of his experience in the Israel army in 1948. Significantly, all the whites arrested in this epoch-making event in 1963 at Lilliesleaf farm, were Jewish: Arthur Goldreich, Rusty Bernstein, Dennis Goldberg, Bob Hepple, and Dr Hilliard Festenstein. Their trial in October 1963, known as the Rivonia trial, resulted in the imprisonment of its leaders, including Nelson Mandela, for life. Harold Wolpe, a member of the Central Committee of the Communist Party, who was not at Lilliesleaf at the time, was arrested a few days later. He and Goldreich escaped from Marshall Square police station and crossed the border to Botswana. “he was proud to acknowledge the Jewish roots of his compassion. Brought up as a child in a Lithuanian ghetto, he experienced at first hand the degradation and misery of being unfairly treated for no proper reason. So in the South Africa he grew to love, he determined that no one should be singled out for unfair treatment for no proper reason..," The disproportionate representation Jews amongst the minority of whites that chose to cast their lot in with the oppressed did not go unnoticed by the racist regime.’. “We are assembled to mourn the passing of a leader, a patriot, a father, a fighter, a negotiator, an internationalist, a theoretician and an organizer. Indeed, it is the combination of all these qualities so splendidly in one individual, which made Comrade Joe Slovo the great African revolutionary that he was. When, in 1934, the village of Obelkei in Lithuania, bequeathed to South Africa an eight-year-old Yossel Mashel Slovo, there was no predetermined course that his life would follow. Forced to leave school at an early age because of poverty; part of the passionate political debates of that period among immigrants in Johannesburg; - all these factors helped mould one of the greatest South African and African revolutionaries of our times. For many years, the lone voice in parliament that stood courageously against apartheid came from Helen Suzman. As founder of the Progressive Party representing the predominantly Jewish constituency of Houghton, she was a thorn in the side of the national government. Much to the chagrin of the government, Suzman made frequent trips to Robben Island to visit Nelson Mandela while he was jailed there. Advocate Isie Maisels won acclaim for his leadership of the defense team which achieved acquittal of all the accused in the treason trial As a committed Jew, he had served as President of the Federation of Synagogues, as well as on the Executives of the Jewish Board of Deputies and the South African Zionist Federation. Justice Albie Sachs , presently a member of the South African Constitutional Court., was a freedom fighter in the ANC. Twice he was detained without trial by the security police under the Apartheid regime. When he was a 17-year-old law student, participating in civil disobedience in the early 1950s, he led a small batch of whites, into a post office protesting the denial of equal rights for Blacks. About twenty years later he was the victim of a bomb attack by the South African security force in which he almost lost his life and which left him with one arm missing. In The Soft Vengeance of a Freedom Fighter, he describes his recovery from this attempt to kill him. From his early days, Advocate Kentridge (later Justice) appeared courageously in highly political matters, unpopular with the apartheid government. He defended cases for the Garment Workers' Union and its Secretary, Solly Sachs. Also Bishop Ambrose Reeves. He appeared at the inquiry into the shooting at Sharpeville, in 1961. He attained international acclaim for his powerful cross-examination of the security police in the inquest into the death of Black Consciousness leader, Steve Biko. During WW2 Wolfie Kodesh was caught agitating black soldiers to stand up for their rights. Together with men like Jock Isacowitz, Jack Hodgson, Rusty Bernsein and Cecil Williams he was one of the founders of the Springbok Legion. Back in South Africa after the war he was a member of an ANC committee organized to protect Nelson Mandela when he went underground in 1961. Kodesh acquired an apartment in the Whites only Johannesburg suburb of Berea, under an assumed name and persuaded Mandela to take refuge there, as he believed a White area would be the safest place for him to stay. It was from this apartment that Mandela went to Goldreich’s farm, Lilliesleaf in Rivonia, leading up to the Rivonia Trial. Not everyone who took part in risky illegal anti apartheid activities was caught. Many managed to evade detection and therefore remain unknown. In addition to the well-known high profile Jewish anti-apartheid personalities, there were very many ordinary Jews who expressed their revulsion of apartheid in diverse ways and contributed to its eventual downfall. Jews were active in providing humanitarian assistance for Black communities. Typical were the Jewish housewives in the Northern suburbs of Johannesburg who organized educational classes for Black adults in their homes. “Operation Hunger", founded by Ina Perlman reached out to two million blacks, focusing on teacher training and pre-school development as well as sponsoring Black teacher visits to Israel. The South African Union of Jewish Women created outreach programs in black townships. Jews for Justice, and Jews for Social Justice were organizations which worked to build bridges between the white and black communities. Johannesburg's Oxford Synagogue and Cape Town's Temple Israel established nurseries, medical clinics and adult education programs in the townships and provided legal aid for victims of apartheid laws. 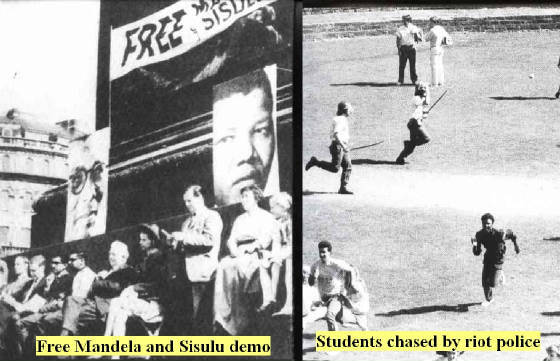 Jews were prominent among the actively anti-apartheid students at the liberal universities in Johannesburg, Cape Town and Durban. As a student at the University of Witwatersrand, I was among the Jewish students who were highly visible in our opposition to apartheid. I was an early member of the Federation of Progressive Students (FOPS), a radical student group initiated by Ruth First, which was subsequently banned by the government. Ruth, who was married to Joe Slovo, paid with her life for her opposition to apartheid. She was assassinated by means of a parcel bomb while hiding out in Mozambique. At the forefront of anti-apartheid demonstrations, we were closely monitored by the Security Police Many of us were assaulted by the riot police or arrested by the Security Police. There were many who, while not adopting high profile stances, opposed apartheid in a variety of ways. Some would tread a fine line, breaking the law by going into the townships to teach adults to read and write (as I did). Many would join the various protest movements. Important contributions were made in the form of enlightened employment practices of prominent industrialists like Tony Bloom and Mendel Kaplan, as well as in many, smaller Jewish owned industries where we broke the job segregation law and introduced equitable working conditions. This also occurred in smaller businesses and households. The Jewish insurance firm CRP headed by Ron Shapiro and Lionel Phillips initiated the very first pension fund for domestic employees in South Africa. It was a completely revolutionary concept in that era. Donna Wurtzel assisted in the promotion. Only the employers paid premiums, with no deduction from employees. Federated Life Assurance headed by another Jew, Arnold Beasserabie, underwrote the fund. Jewish lawyers acted as nominees for non-whites who were not allowed to buy properties in white areas. I was also an enthusiastic member of the Springbok Legion of WW2 ex service men, which had a large proportion of Jewish members. With a peak of nearly 60 000 members it was the only mass movement of whites to take part in the South African liberation movement. It was motivated by of the discrimination suffered by black soldiers in the SA army. National president Jock Isacowitz, uncle of Lynn Lochoff, manager of Beth Protea in Herzliya was jailed for his activities. Then came the Torch Commando, led by Sailor Malan and Kane Berman. It rallied thousands of white South Africans including a high proportion of Jews, in torch-bearing protests against the decision to disenfranchise coloreds. The views expressed by influential rabbis could not be faulted. Rabbis Rabinowitz, Kossowsky, Weiss and Bernard all spoke out bravely and organized some very important welfare efforts, delivering speeches which drew criticism from the nationalist press. Rabbi Abner Weiss, Chief Rabbi of Durban during the turbulent 1970’s, was at the forefront of the protest movement. A constant thorn in the government’s side, he led demonstrations and marches and used every available platform to berate the government over its policies. Bertha Beinashowitz, who now lives at Ahuzat Bayit, Raanana, was national treasurer of the Black Sash, a group of women with a large proportion of Jewish members, who stood silently in protests wearing black sashes. They achieved a lot. 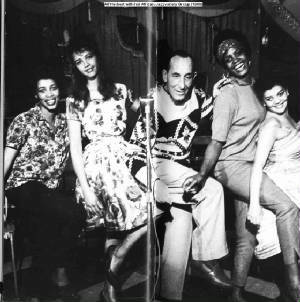 Jewish Contribution to the Development of Black Performing Arts Under Apartheid. The world famous African musical Ipi Ntombi, which brought South African Black culture to the world stage, was promoted under the most difficult conditions by Bertha Egnos. After her death last year at age 90, a memorial service was held at Temple Emanuel paying tribute to her contribution in the stand she took for the rights of Blacks in the Performing Arts. She performed regularly at Dorkay House, 5b Eloff Street extension, Johannesburg where white artists defied the country's race laws by performing together with blacks under one roof. An article in Telfed Magazine by David Kaplan tells of dance instructor, Fonda Dubb who defied apartheid by training boys and girls in a Colored township. Determined that her students be given the opportunity to perform in front of White audiences, Fonda needed to apply for a special permit. Among her memorabilia she has a permit imposing the following humiliating conditions “…that no social mixing with the audience occurs, that the Coloreds do not make use of any of the change-rooms or any other facilities provided for Whites and that they leave the premises immediately after their performance.” Despite the immense difficulties, her Colored students frequently received highest marks, some became teachers and a few went on to perform overseas. Many many more examples of anti-apartheid activity by South African Jews are available to anyone who takes the trouble to look. While the Board of Deputies has been taken to task for its failure to take a public stand in the name of the Jewish community, this was not an indicator of the private views or actions of its members. Evaluating the Board’s attitude to apartheid from minutes of meetings, as done by several historians is completely unrealistic. The board was as unlikely to leave incriminating evidence in writing, as was Oscar Schindler, of Schindler’s Lists fame. The board included some very prominent anti-apartheid personalities such as Tony Bloom, advocate Harry Schwartz and advocate Issy Maisels. Rabbi Duchinsky of Cape Town was instrumental in influencing the Cape Board of Deputies in the mid- seventies to come out publicly against government policy. To comment, please use the form below.